But before we act to raise Tubman’s stature to the point that she is memorialized on commonly used currency, it behooves Americans to understand her role in our common history. It’s a lot more interesting than the description of her as an “Underground Railroad conductor” that appears in my son’s elementary-school materials and many popular accounts of her life. In fact, Harriett Tubman was a gun-toting, Jesus-loving spy who blazed the way for women to play a significant role in military and political affairs. She later went back south — always carrying a gun she wasn’t afraid to use — to help guide her own family and many others out of the plantations. The courage and will that this took is difficult to fathom. 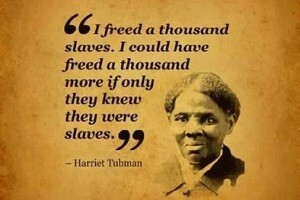 But she’s really a secondary figure in the history of the Underground Railroad. Historians estimate that she led 300 or so people to freedom, while figures like William Sill and Levi Coffin helped bring freedom to thousands. This isn’t to say that Tubman is a minor figure. To the contrary, what she did during the Civil War secures her an important place in history. The Union, fighting a war mostly on southern soil, desperately needed good intelligence. Tubman’s exploits on the Underground Railroad, quick wits, mastery of stealth, knowledge of local geography, and personal bravery made her a near-perfect scout and spy. She could often “hide” in plain sight, since white-supremacist southerners probably were not inclined to consider a small African-American woman a threat. During one of her scouting missions along the Combahee River, she became the first woman and one of the first African Americans to command a significant number of U.S. troops in combat. The raid she organized and helped to command freed far more enslaved people than her decades of work on the Underground Railroad. She also was a strong advocate of allowing African Americans into the Union Army. She knew Robert Gould Shaw, who commanded the almost entirely African-American 54th Massachusetts Volunteer Infantry regiment — the unit at the center of the 1989 film Glory. A (probably apocryphal) legend even has it that she cooked his last meal before the heroic assault in which he and much of his regiment perished.